Chili sauce is one answer to that bumper tomato harvest. The perky piquant sauce can compliment many classic recipes like meatballs, meatloaf, cutlets, chops, tenders, eggs, potatoes, etc. This recipe is from Ball Blue Book of Canning (2010) and is what I’d deem a standard chili sauce for a wide variety of family uses. It is not too spicy or hot - but that makes it more versatile for different uses. You can easily make part batches if you don't have as many tomatoes, and a smaller batch will shorten the simmering time a little. For example for one-fourth recipe, change the 96 in "Number of servings" below to 24 and click "Calculate." Combine tomatoes, onions, peppers, sugar and salt in large saucepot. Simmer 45 minutes. Tie spices in spice bag and add bag to tomato mixture. Simmer uncovered until reduced by one- half. As mixture thickens stir frequently to prevent sticking or scorching. Add vinegar and simmer uncovered to desired thickness, stirring occasionally. Serving Ideas for chili sauce: (1) Pour over meat loaf in the final 20 minutes of baking. (2) Pour over a block of cream cheese and serve with crackers. Will try this soon, as I use chili sauce a lot and have been making the same recipe for some time. The only thing I'll do differently is drop the tomatoes in boiling water and then peel them. Thanks for your feedback Myra. Let me know how your recipe stacks up against this one. And yes, blanching the skins a few seconds is the only way I "peel" tomatoes for canning. This is very similar to a chili sauce my Mom made when we lived in a small Nebraska farm town when I was growing up. I never got her recipe but yours certainly brings back fond memories of bumper crop tomatoes in our large back yard. Thanks for sharing! I gave all my canning gear to my youngest daughter but this looks like a good opportunity to get her down to the Bay Area from Auburn and do some canning with me. Thanks for your review, Bob. I agree canning is better as a family undertaking and a good excuse to joke as well as commiserate over food preservation production. Of course there's always the option of making a small batch and just refrigerating it; with the amount of vinegar, chili sauce will keep a long time like that. I've a friend who does that with jam because she too gave away her canning paraphernalia. 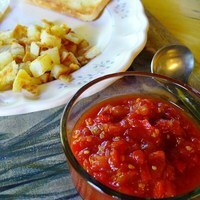 I love chili sauce and it's a great replacement for ketchup on burgers. I also love to can my own tomatoes too. Thanks for sharing. This looks nice. I could try and make this one. I like spicy.